The trough of low over south west Bay of Bengal adjoining Sri Lanka coast persists. The influence is felt only over lower latitudes of TN coast as few showers seen creeping in over Nagai-Cuddalore coast. However due to the weak nature of the said disturbance, partly cloudy weather would set in and isolated rains might occur in few pockets of TN coast. South TN districts like Ramanthapuram, Tuticorin, Kanyakumari and few ghat areas of Tirunelveli district would see noteworthy rains for next 2-3 days. Most interior districts would see warm weather during day hours. 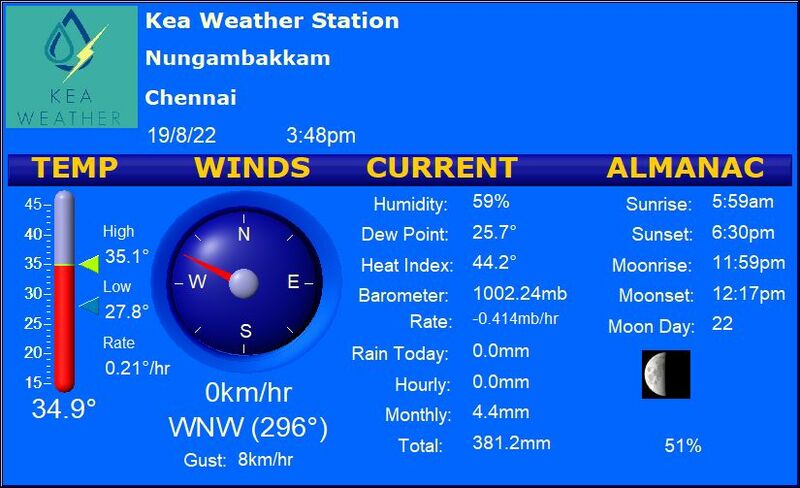 Chennai – Partly cloudy weather. Few areas might see some drizzles. Max temperature should be around 31 C and minimum temp should be around 21-22C. Vellore – Some clouds with a high of about 31 degrees and a low of about 18 degrees. Trichy – Overcast conditions with on and off light rains. High of about 31 degrees with min around 22C. Madurai – Mostly cloudy with mild showers. High of about 33 degrees and a low of about 22 degrees. Coimbatore – Partly cloudy and warm with a high of about 32 degrees and min of around 23C.